Weddings, wedding, weddings – It was the week of weddings and I saw most of them. 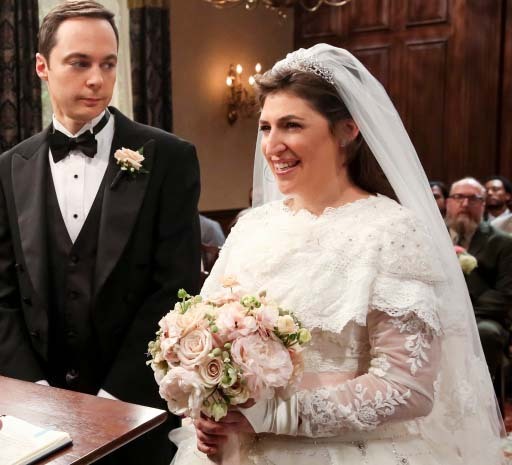 Sheldon Cooper got married in nerdy style on The Big Bang Theory along with Alex and Jo on Grey’s Anatomy. We ended with Harry and Meghan. I find weddings a symbol of hope and beginnings. I love every one of them. They all make me cry (for reasons I can’t figure out). I love the familiar routines even when they are different from my own. The gowns are amazing from the foo-foo swan gown that Amy wore to the elegant one for Meghan. Call me an old romantic. A big surprise – Although I wanted to see the royal wedding I had no intention of getting up at 4:30 a.m. and I couldn’t find an exact time for the nuptials. I was surprised when I got up just after 7 a.m. to find out that the beloved husband had it on the TV and was watching. He’s an old romantic too. We just needed some wedding cake. Very weird dreams – This past week I dreamt of my high school bestie’s brother. He was four years older and off at college when I met her. I saw him maybe twice and he wasn’t interested in spending any time chatting with a kid. I have no idea what prompted that dream but I hope all is well with the family. More acronyms – I heard a commercial for a solution to LBL. I never heard of that especially as a “disease” or “malady.” I listened up. I never caught the first word but the last two were bladder leakage. It’s been elevated! The Friday song – I’m retired. Weekends and Fridays are meaningless to me except that our local morning radio station plays a “cute” Friday song as the DJ signs off in the morning. I find myself looking forward to hearing and singing the jingle. Definite ear worm! Since no one invited me to either wedding, the photos are obviously not mine. They were floating around the internet. The first one is credited to Ben Stansall but I couldn’t find a credit for the second. This entry was posted in Childhood memories, Friends, Humor, Life at Home, Other People, Random Five and tagged acronyms, childhood friends, dreams, ear worms, LBL, memories, royalty, weddings by Kate Crimmins. Bookmark the permalink. It may be one of the things that radio stations do. Attending a not-so-royal wedding, I was impressed with one guest’s elaborately plumed hat. She reminded me of the chapeaus to be admired at a wedding in England. One of these days I intend to wear a crazy hat somewhere – just to create a stir maybe. You can be a member of the red hat society! I enjoyed seeing Sheldon and Amy get married as much as seeing Harry and Meghan. Call me a romantic, too. It was a good week for hope and love. We need more like it. I cannot imagine voluntarily choosing the life of a royal. It seems horrific to me. I hope she is happier than her late mother in law. She is certainly as beautiful. I wouldn’t either. I can’t stand living in a fishbowl. Something about privacy I treasure. I kind of like weddings too, as long as I’m not involved! Didn’t get to watch either Shamy or the royal wedding, but heard lots of after-reports. Glad you got to enjoy them both! I enjoyed “Shamy’s” wedding as much as the other. Maybe because it was done in 30 minutes! I didn’t see any of the wedding…and there weren’t any pictures in the paper today. I thought that strange. It is weird how peeps show up in dreams even if you hardly knew them. I sometimes wonder if there is some sort of message in there. Odd there were no pictures. Our paper had a few. As for dreams, I did worry that there was a message there. I have no idea what it is though as he was never in my life. 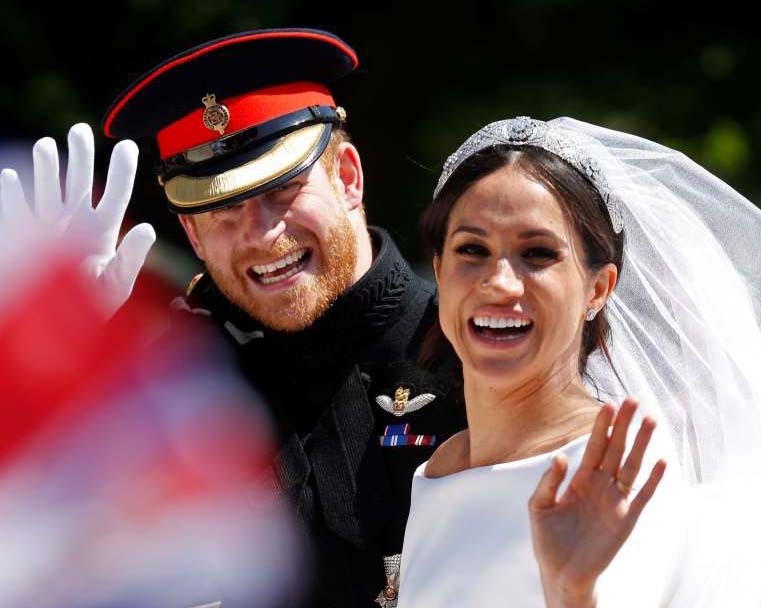 A couple of male Facebook friends pooh-poohed the wedding, saying that those of us who enjoyed hearing about it were trivial and besides the British monarchy was a powerless vestige of the past. I disagree. Marriage is a big thing. There’s nothing wrong with enjoying the beauty and pomp and circumstance of the event. Looking at beautiful dresses, fancy hats, a profusion of flowers, prancing horses, and a huge ancient church makes me happy. I also enjoyed hearing their stories–how strong they are and how they’ve overcome obstacles. It’s all a welcome change from the depressing news we hear every day. There are always the haters. I wish they would scroll by without dispensing their vitriol. I’m like you. I cry at weddings. Most of the funerals I’ve been to were like happy family reunions. John was up first and turned on the TV for the royal wedding. David joined him, and I came in when William and Harry were walking to the church. John watched a bit while doing other things, but he saw all he wanted to see. I did other things too as there was a lot that was just long! I wanted to see the dresses and the people. As for the sermons and such, I caught parts. You did it well, then. I am right with you. I love weddings! I also saw the Big Bang wedding which definitely had some Awh…moments in it, and Grey’s anatomy had my eyes a little moist! I want to see the Royal Wedding this week since I did not make it up early enough to watch it live! There is just something about a wedding! You are so right! There is a magical feeling in the air. A bubble of bliss. It was the season finale. Something had to go seriously wrong! I’m just glad no one was shot! Drat! I missed that series of Big Bang! I have been focused on the season finale of most shows that end on the death of my favorite character! That happens to me too. For that reason I hate most season finales! I should get that to watch. I’ve always been fascinated with the royal family. Congrats on your anniversary and still liking each other is great! You are right. None for a long time! I tried to find an agenda but was unsuccessful. I wasn’t so interested in seeing arrivals and listening to trivia so I opted to catch the highlights later on. Fortunately I was up early enough to see the nuptials. I didn’t see the walk down the aisle live but they did some replays and I got to see it. I didn’t watch the wedding but I’m enjoying looking at the photos. Unlike Charles and Diana’s, this marriage seems to be based on real love and respect for each other. I can’t imagine living the life of a royal, but I hope she remains happy in her new role. I think you are right. This is more of a love match and you need that to survive the lifestyle. Don’t think I could do it. I guess I’m a terrible unromantic. I don’t care for weddings, for reasons I won’t say so as not to spoil others romanticism. Except, my bestie’s daughter is getting married soon, and I’m very happy for both of them. My bestie is so excited. Her daughter used to say she didn’t want to get married, so this is a very welcome surprise. Hope you’re enjoying your weekend. It’s rainy/damp here today. Chilly too. But, they say 80”s are coming this week. It is a cloudy day but at least dry and warmer finally. Although I thought Amy’s dress a bit “hideous” . . . she still looked beautiful beaming her bright bridal smile! I agree with both. It’s the bride that transcends the outfit. Truth be told I liked Catherine’s gown better but the bride was beautiful. Time will tell how it all plays out but I’m wishing them the best. He gave a few too many examples of how we harnessed the power of FIRE ~ I think most people got it after the Bronze age & the Industrial age, without needing him to iterate Trains, Planes, and Automobiles. 🙂 We Americans have no patience for sure! I missed the whole speech and only caught parts of the brimstone and fire. Have always been enamored with the Royals. I think that comes from growing up with a Mom who promoted believing in fairy tales. Yesterday’s fairy tale wedding did not disappoint. However, later in the day, CBS (I think) brought in Diana’s physic…she was all gloom and doom…said Diana was not happy. Whether you believe or not, I wish they had not tried to bring down the obvious joy everyone felt. I think Diana was in that empty chair smiling from ear to ear. I’m with you. No matter what she “heard” or “thought,” it wasn’t the day to verbalize it. Makes me wonder if she was looking for 15 minutes of fame. Time will tell and I wish them the best. I love weddings, too. I was watching the royal one here in California, but of course not live! Live for you is even earlier than here on the east coast! I caught the actual vows at around between 7 and 8. There were some gorgeous photos of Harry and Meghan floating around the internet. One from above in the shadows of the chapel looked like an old Renaissance painting. I was happy that they both looked happy, after so much tragedy and familial dysfunction in their lives as youngsters. And that the inbred British royal family is getting some much needed melanin. Yes, some color will help with the pasty look! Didn’t worry about watching the royal wedding. I figured there would be enough reruns to keep me from missing anything. Sure enough, there was nothing on CNN yesterday but the wedding. Today it will be back to school shootings and dead children. It hurts my heart. I needed the wedding to see some happiness. Hurts my heart too. I’m too old to understand it all. Back in my day there were fist fights, not gun fights. Nobody was dead. I think the first L in LBL is light. I think in a previous life I must have been a beach bum or maybe a resident of a nudist colony. I like weddings, but I’m probably the only woman in the world who doesn’t like to get dressed up to go somewhere. If I could go to a wedding wearing flip flops and a tee shirt, now that would be perfect! I like the occasional dress up occasion but I also like the sandals and flowy dress occasion. Deep in my heart I am a hippie still. It’s been a week since we’ve seen the sun. With high humidity and tropical downpours all week, I’m feeling like a mushroom. The forecast this week doesn’t sound much better. I want my spring back! I didn’t watch any of the wedding. There was so much media hype by the time the big day rolled around, I’d had enough. I am seeing peaks of sun today for the first time in a while. We didn’t see 60 yesterday but expected to hit 80 today. Damn bi-polar weather. My tomatoes want to go outside and play! Couldn’t sleep Friday night so watched the Royals get married on You Tube. Hoping to see some highlights on Sunday Morning. Our week was stormy and rainy… we will take the rain to try to stay away from drought and fill up the glorified pond! We have been above normal for precipitation this year so no draught (hopefully). Stormy and rainy sums it up. Must have been like that almost all over. A friend went to Florida and it was rainy there too. The royal wedding left me sad. Kept thinking of Diana, someone I’ll always admire. Liked that the new Missus wore her emerald ring, but would have been so much nicer for Diana’s youngest if she were there beaming with it on her own finger. Moot I know, but…we’re very sentimental these days. Any pond news? Is it still too chilly? I see frogs in vests and sweaters. I went in the other direction thinking that Diana would be so happy that her youngest has found a good love match. He’s had other loves before but it takes a special person to be able to withstand that press scrutiny and hounding and I think he found it. I didn’t mean to imply Diana wouldn’t have been happy, just that it’s a shame she’s not here. Both her sons are the way they are more because of her than anyone. They have her heart that so beats for others. They truly do seem to be good people. Yeah…I’ve read so much about them. Both sons are very special. I think she’s tough, but I also think that after the problems previous girlfriends had, he was determined to stand up for her, and that really seemed to help. It takes a certain kind of person to flourish in that environment. One day people love you, the next they criticize. His Dad has taken quite a beating in the press and I’m not convinced it was deserved. I’m glad you said that. I haven’t really thought much about Charles, but you’re probably right. People have been excessively harsh to him and Camilla. They made Diana into the heroine and Charles into the villain. Love matches work best and he and Diana were not a love match.